Psychology, as you may already know, is a branch of science that studies the behaviors and the minds of organisms. It deals with the conscious and the unconscious, as well as feelings and thoughts. Its main aim is to understand individuals and social groups by studying specific cases and using the answers found through them to establish general principles. You may also see how do you write a speech. Basically, psychology is a perennial attempt to understand the many complexities that make up a man by understanding what thought or emotion served as the catalyst for his actions. But what is the relationship of all of that to telegraphic speech? You may also like presentation speech examples. You see, for psychology to understand a person, it needs to start from the very beginning of that individual’s existence, which means that they have to start from the time when an individual has not acquired general speech yet, or learned how to form coherent thoughts. 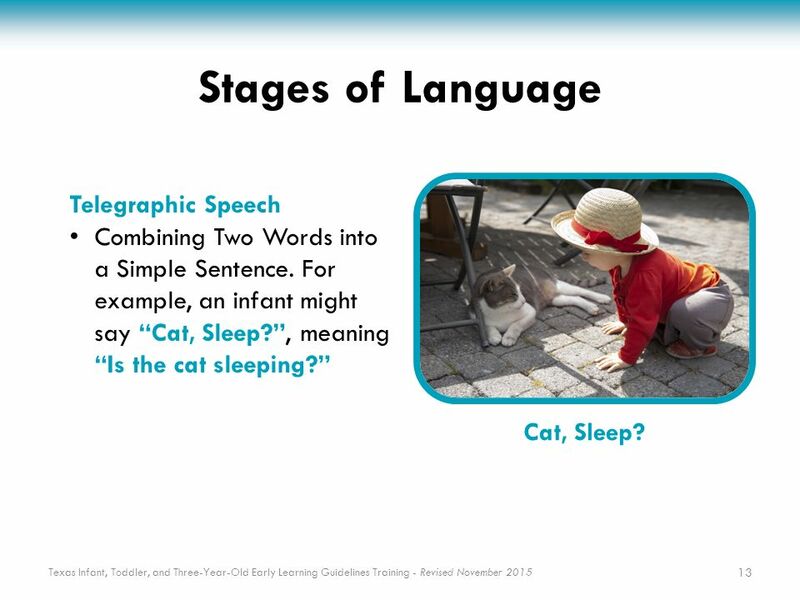 And from countless studies and years of observation, psychology, with the help of linguistics, has deduced that speech or language acquisition has many stages. If you’ve ever been around a 2-month old baby, you might notice that all he is capable of saying are vocalizations like oohhh and aahhh (which we admit we find adorable). This is because the child’s only speech ability are soft vowel-like words. (It would also be a little disconcerting to see a newborn baby, with his umbilical cord dangling from his navel, talk in business English, so it’s best that they stick to cute sounds for now.) This speech ability is referred to as cooing. You may also see how to start a speech. 4 months later (or 6 months after the baby is born), he will exhibit an ability to make speech-like sounds (which isn’t exactly speech yet but it’s a good start). Repetitive syllables that make no sense at all like ma-ma-ma or ba-ba-ba characterizes this stage. You may also like wedding speech examples. 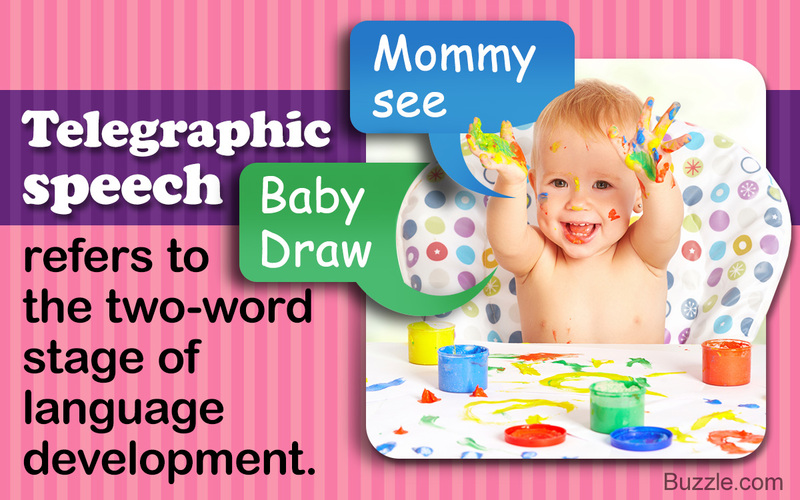 At 9 to 12 months old, the baby will already learn his first few words such as the much-awaited mama and dada. They will have the ability to use holophrasis to express themselves, in addition to the babbling and the cooing. 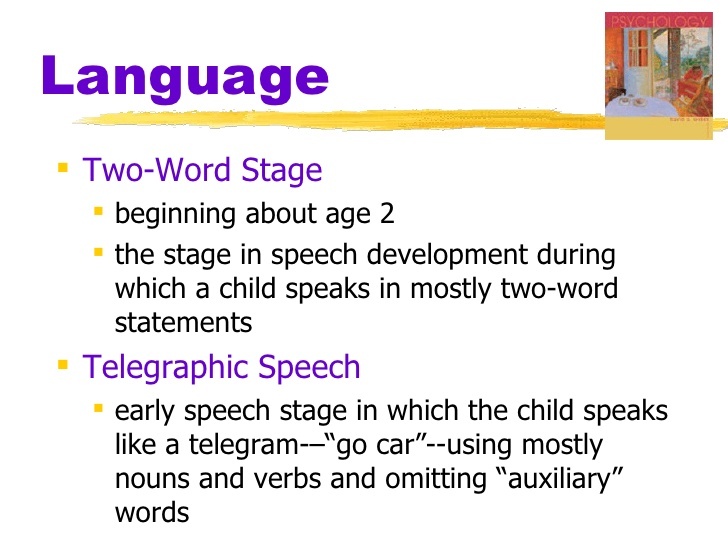 Telegraphic speech is the verbal ability developed by individuals during the two-word stage (or the second year of a baby’s life) of language acquisition. It is characterized by talking with the use of an extremely short set of words instead of a full-on sentence. You may also check out campaign speech examples. At this stage, the baby will experience what experts call “the naming explosion” which is what they have named the child’s speech ability that is limited to nouns. The speaker will only utilize the important content words and omits grammatical words, such as conjunctions and prepositions. You might be interested in welcome speech examples. Babies, at this stage of their language acquisition, only has about 200 to 300 vocabulary words, but this meager number rapidly escalates by the time he turns 2 1/2 years old. From telegraphic speech, the baby will slowly learn to be more eloquent since he will learn new words every month until he perfects his formal speech abilities. According to psychology, language acquisition is paramount during the first 5 years of a person’s life, starting from his birth. This is why parents and caretakers make it a point to continually talk to their child even if he can’t speak back because the exercise’s main professional goal is to at least get a response from him, whether it is in the form of sounds or the occasional tantrum. What Is Telegraphic Speech Again? The term telegraphic speech was first coined by the psycholinguist Roger Brown back in 1963. 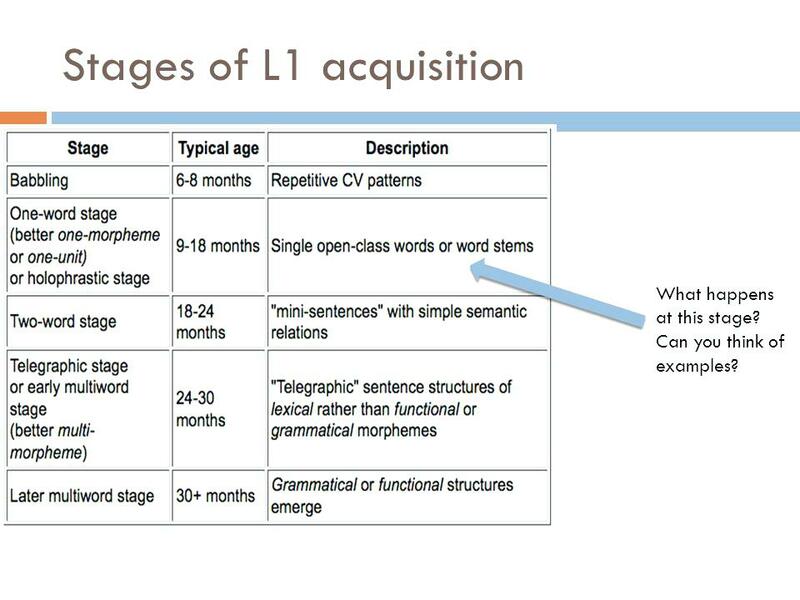 As we’ve discussed earlier, it refers to the two-word stage that every person goes through in their language acquisition. The name is inspired by the act of sending telegrams. You may also see appreciation speech examples. Back in the day, telegrams were charged by the word, which means that the more words you use, the bigger you’ll have to pay for your telegram to be sent. Knowing this, people, being smart spenders, would try to use as few words as they can to express their intentions through the telegram. They have developed a very compressed style of writing that doesn’t involve conjunctions or articles. Obviously, eloquence wasn’t a trend in telegram-writing. You may also like thank-you speech examples. This concept is very similar to the speech ability of children around 2 years old (although, in their case, they are not doing it on purpose). They’ve learned to express themselves using very limited words. Notice how some kids use a word for basically everything they see, like using the word doggie even for animals that aren’t dogs? That means that they are going through the stage of telegram speech. 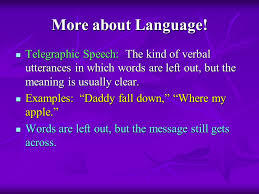 Basically, telegraphic speech means taking away the grammar in the sentence to only leave the content words. It is not until the child learns three-word utterances that he starts applying grammar and observing the proper structure of a basic sentence. However, he starts paying attention to it all even before he learns how to put two words together. You might be interested in middle school speech examples. Children don’t automatically speak in fluent English the moment they are born. This is an ability that they develop over time with the help of the people around them. They would start with sounds, then with syllables, then move on to single words, and, finally, to telegram speech. You may also check out leadership speech examples & samples. If you’ve been around babies, you might have done some serious baby talk. Notice how you purposely try to simplify sentences, and use words like kitty and doggie and choo-choo train instead of the regular cats, dogs, and train? This is because adults think that by using words like that, the children they are talking to will understand them better. You may also see orientation speech examples. But experts have discovered that children can actually comprehend what adults say even if they use complete sentences and observe proper grammar. In other words, kids are not stupid. Although they can’t respond to what you just said, they can perfectly understand your message. You may ask, “If this is the case, why don’t kids just speak like grown-ups?” Well, to answer your unexpressed question, experts assume that it’s because kids consider grammatical functions and inflections as completely unnecessary to express what they want. So instead of saying, “Mommy, I want to drink milk,” they say, “Mommy milk,” because the message gets delivered just as well. (In a way, kids are smarter than us.) You may also checkout acceptance speech examples. It is also believed that the omissions are caused by the presence of cognitive limitations on the length of utterances in children. So irregardless of their refined ability to speak in grammatically flawless full sentences, they would still be hindered by their own abilities. 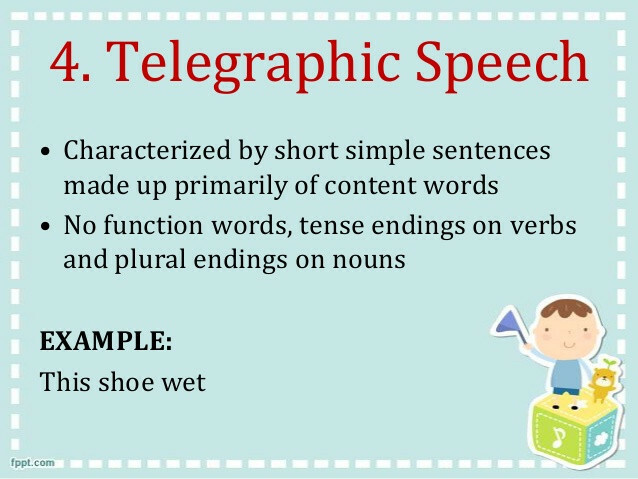 Due to these limitations, kids prefer to use telegraphic speech instead. You may also like launch speech examples. Most of us think that if we talk to babies the way they talk to us, we are helping them comprehend us better. Although this seems a good theory, it couldn’t be more wrong. Since babies are still learning how to talk, they rely on everything that they see and hear in their surroundings to help them learn a language. 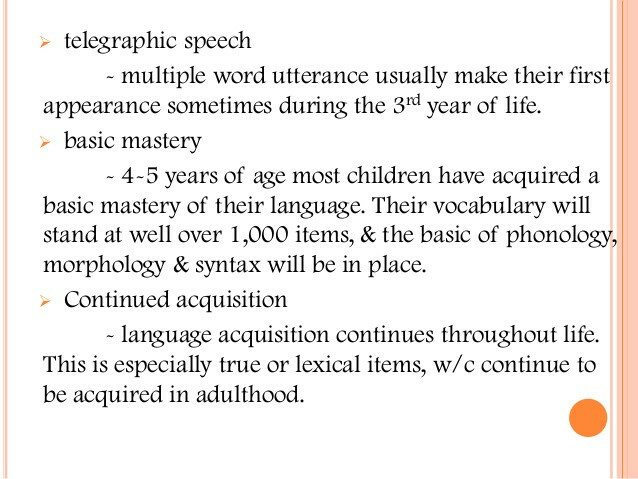 So if you keep talking to them using telegraphic speech, how do you expect them to learn anything more than that? You may also see retirement speech examples. Language delays and disorders seem to be as rampant as they are unwanted. It’s true. Kids progress and develop at their own pace. However, they may need a little nudge and the occasional push to help them get there. Telegraphic speech in kids is completely normal and not something to be frowned upon. But adults using this type of speech to talk to children? It’s something else. You may also check out narrative speech examples. 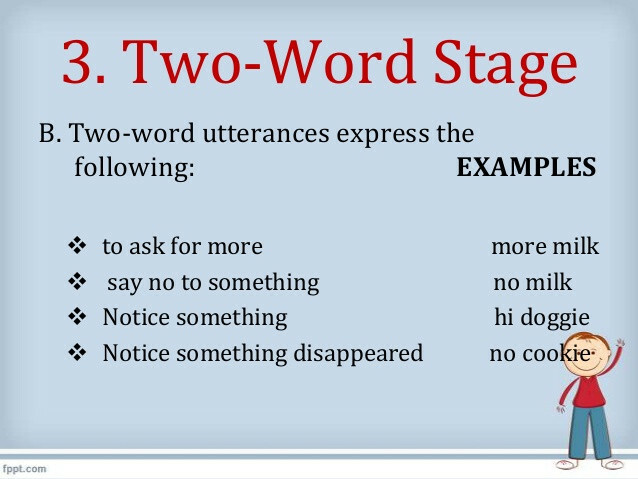 Let us all treat the stage of telegraphic speech as a stopover where the kids will, hopefully, only stay for a short period of time before a long list of vocabulary words flood them with words too many to be used in one sentence. Parents, guardians, and everyone directly surrounding a child need to play the role of a teacher to the young mind’s speech ability. You might be interested in dedication speech examples.